During the 1960s, the SS United States became caught in a squeeze of declining revenues and increasing costs that would eventually force her out of service. Commercial jet service between Europe and America had begun in 1958. As the 1960s progressed, more and more travelers defected from the ocean liners to the skies. In fact, on some crossings, there were more crew members aboard the United States than paying passengers. The United States Lines successfully petitioned the government to allow the SS United States to do some cruising in addition to her transatlantic crossings. These proved successful but not enough to offset the loss of business on the Atlantic. At the same time, the unions that worked the ships were becoming more militant. Labor costs increased and a series of strikes damaged the ship's reputation for dependability. Fuel costs were also increasing. The ship badly needed its government subsidy but the government was becoming an increasing reluctant partner. By late 1969, the owners had had enough. Union demands kept increasing and the government had said it was not going to renew its yearly subsidy. On November 7, the ship received orders canceling the upcoming cruise and directing the ship to proceed to Newport News, Virginia supposedly for her annual overhaul. When the ship arrived in Virginia, it went to a berth rather than into the drydock where she usually went for overhauls. All work was ordered stopped and the crew told to leave. Indeed, the funnels were left with only one side re-painted. The SS United States was being laid-up. She has not sailed on her own power since then. The United States Lines continued to pay for her berthing and maintenance, first in Newport News and later in Norfolk, until 1973. At that time, it surrendered the ship to the federal government for $4.6 million and the SS United States became the responsibility of the U.S. Maritime Administration (“MarAd”). To prevent damage from dampness, MarAd had dehumidifiers installed. In addition, all but two of the exits were sealed. As a result, the ship's interior was perfectly preserved, frozen in time. The government considered various uses for the United States including converting her into a full-time hospital ship that could support the fleet and U.S. military operations as well as humanitarian relief efforts. However, these proposals never gained the necessary support from the Navy, which would have operated the ship. By 1978, the Navy had decided that the SS United States no longer had military value. Inasmuch as MarAd's client agency was no longer interested in the ship and there was a cost to maintain her, MarAd decided to put the United States up for sale. Even though the ship had been out of the public eye for almost a decade, a number of proposals were made as to her future use. These included converting her into a museum, a shoreside hotel, a conference center or a cruise ship. One line that considered purchasing the ship was Norwegian Cruise Line, which was interested in converting a large ocean liner into a cruise ship. But there were a number of recently retired liners to chose from and Norwegian decided the SS France, which had been withdrawn from service in 1974, best suited its plans. She became the very popular SS Norway. Eventually, the United States was purchased by Richard Hadley who also wanted to use the ship as a cruise ship. Hadley's United States Cruises would be different than other lines because it would not offer tickets for each cruise to the general public. Rather, each cabin on the ship would be a time-share condominium. 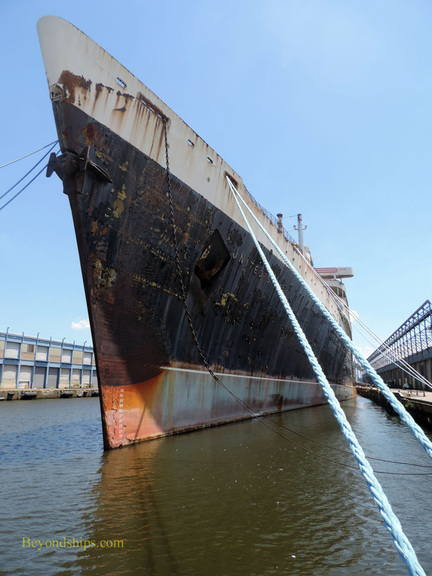 During this time, the SS United States was drydocked so that her condition could be assessed. The verdict was that the ship was still in excellent condition. Unfortunately, the Hadley plan became the first in a series of grand schemes that would never come to fruition. The new owners ran out of money. Indeed, to pay off debts, the contents of the ship were auctioned off in 1984 dispersing the ship's instruments, decorations, furniture, cutlery, plates, blankets and other furnishings to the four winds. But the sale of the contents, was not enough. United States Cruises could not pay its operating expenses much less raise the $150 million needed to proceed with its conversion plans. U.S. Marshals seized the SS United States in February 1992 and sought permission from the courts to auction off the ship. While this first attempt to bring the SS United States back to life started out with high hopes, it ended as a disaster for the ship. Her historic contents were gone and the private owners failed to continue to dehumidify the ship as MarAd had done. As a result, the SS United States was left to deteriorate at her berth in Norfolk.